With a stay at San Juan Water and Beach Club, you'll be centrally located in Carolina, a 1-minute drive from Carolina Beach and 11 minutes from Condado Beach. This 4-star hotel is 6.1 mi (9.9 km) from Puerto Rico Convention Center and 7.3 mi (11.7 km) from Port of San Juan. 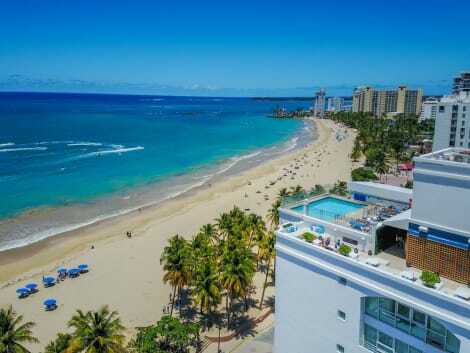 A stay at San Juan Airport Hotel places you in the heart of Carolina, within a 15-minute drive of Condado Beach and Puerto Rico Convention Center. This hotel is 8 mi (12.9 km) from Pier 1 and 8 mi (12.9 km) from Castillo de San Cristobal. Make yourself at home in one of the 450 air-conditioned rooms featuring kitchens with refrigerators and ovens. Rooms have private balconies. Flat-screen televisions are provided for your entertainment. Conveniences include phones, as well as safes and desks. lastminute.com has a fantastic range of hotels in Isla Verde Beach, with everything from cheap hotels to luxurious five star accommodation available. We like to live up to our last minute name so remember you can book any one of our excellent Isla Verde Beach hotels up until midnight and stay the same night.